YUSU Volunteering provides quality opportunities for students to volunteer, encounter new experiences, develop skills and make a difference to the community, both locally and within the university. We have a range of opportunities available through our 16 student-led volunteering projects, one-off events with charities and other voluntary organisations. There is something to suit all interests and time commitments with chances to work with people in big and small groups, challenge yourself and learn new things. Browse through the opportunities below, find something that appeals to you and get in touch! These are long-term, entirely student-led projects that run with support from the Activities Officer, Community and Wellbeing Officer and Student Opportunities Coordinator (Volunteering & RAG). We have 16 volunteering projects currently that provide a diverse range of opportunities which fit into four broad categories- Children and Young People, Conservation and the Arts, Older People and Campaigns, Welfare and Community. We appreciate that sometimes your schedule is so busy that a long-term volunteering opportunity is not Have only a limited time to volunteer? Not to worry, we have plenty of opportunities available to suit your schedule. Have a look at our Give it a Go schedule and come along to the sessions on there, or get in touch with the Volunteering Officers, Ellie and Hannah (volunteering@yusu.org), to sign up to their mailing list. This year, we are looking for ‘RAGlets’- volunteers who are interested in volunteering at fundraising events. You can help just on the day, or you can help the RAG committee in the organising of events. Get in touch with your RAG Officer, Roz Walton (rag@yusu.org) to sign up to the mailing list. Hi, we're Alice and Jasmine, your YUSU Volunteering Officers for 2017/18! 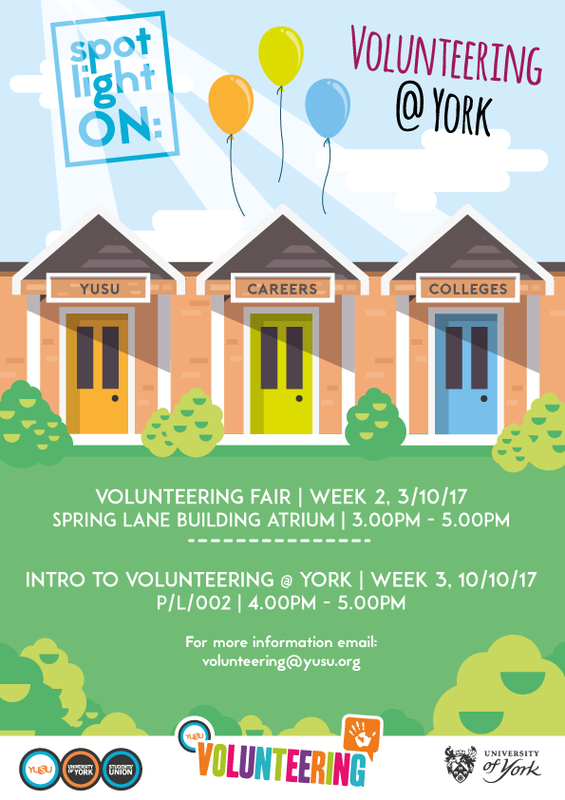 Our job is to handle all of the volunteering opportunities within YUSU, whilst also working with Careers, the University, and Colleges. We have 16 student-led Volunteering projects and we put on one off events - MAD (Make A Difference) days, as well as advertising external volunteering opportunities to students. We are always keen to match students with these opportunities and are also open to new ideas. Each year, National Student Volunteering Week falls in Spring Term. We work alongside the national team to create volunteering opportunities for students to get involved in - please get in touch if you'd like to find out more. Thank you to everyone who took part in National Student Volunteering Week 2017. Keep an eye on this page for updates on National Student Volunteering week 2018!